5+ years of campaigning and we finally have some great news. 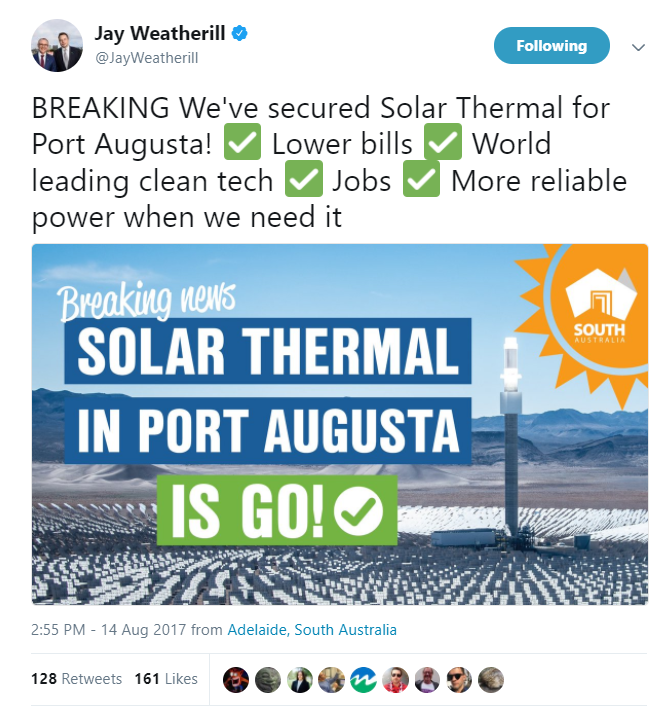 Solar Thermal is going to be build in Port Augusta! 150MW CST (Concentrating Solar Thermal) plant. The South Australian state government is buying the power from it at a maximum of $78 per megawatt hour. Starting construction in 2018, to be completed by 2020. Today, we are taking another massive step forward in delivering our plan for reliable, affordable and clean power for all South Australians. 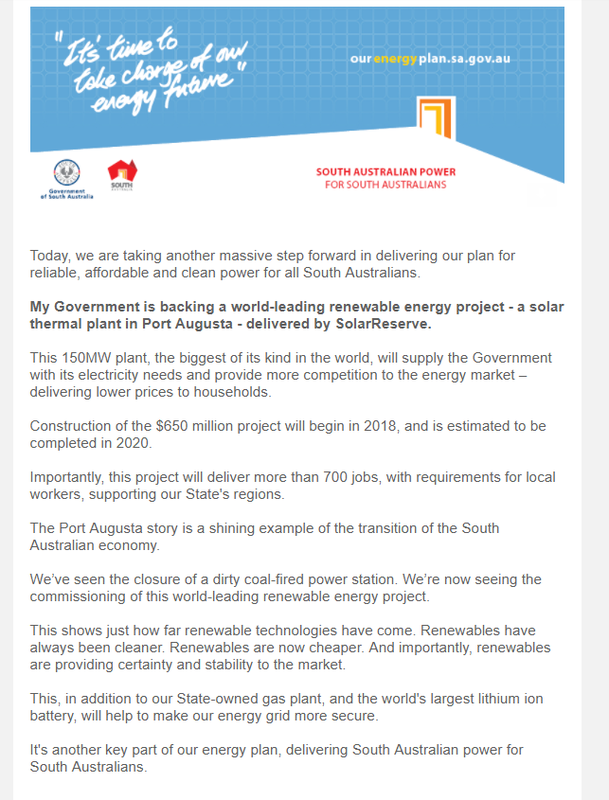 My Government is backing a world-leading renewable energy project – a solar thermal plant in Port Augusta – delivered by SolarReserve. This 150MW plant, the biggest of its kind in the world, will supply the Government with its electricity needs and provide more competition to the energy market – delivering lower prices to households. Construction of the $650 million project will begin in 2018, and is estimated to be completed in 2020. Importantly, this project will deliver more than 700 jobs, with requirements for local workers, supporting our State’s regions. The Port Augusta story is a shining example of the transition of the South Australian economy. We’ve seen the closure of a dirty coal-fired power station. We’re now seeing the commissioning of this world-leading renewable energy project. This shows just how far renewable technologies have come. Renewables have always been cleaner. Renewables are now cheaper. And importantly, renewables are providing certainty and stability to the market. This, in addition to our State-owned gas plant, and the world’s largest lithium ion battery, will help to make our energy grid more secure. It’s another key part of our energy plan, delivering South Australian power for South Australians. The main reason the Repower Pt Augusta campaign exists is because of the group Beyond Zero Emissions. The group CLEANSA (who I was actively a part of at the time) helped organise BZE to give presentations in Adelaide and Pt Augusta. This helped setup the Repower Pt Augusta community. AYCC, the Australian Youth Climate Coalition then got on board and especially with the help of Daniel Spencer the Pt Augusta community did a vote between gas and Solar Thermal, they overwhelmingly chose Solar Thermal. Then came the big Walk for Solar. 100+ people (including myself who filmed most of it) walking from Pt Augusta to Adelaide over the course of 2 weeks, with a massive rally at the end. That was a really epic experience and very bonding. Many of the people involved have gone on to do amazing things. With community support came political support. A Senate select committee was formed to investigate it. The commercial interest was there from very early on. However at the start Alinta energy was the owner of the Northern power station, the large coal power station that was due to be closed down. This however ended up being closed down early after a fire. During the 5+ years there was an ever increasing amount of SA’s power being generated from wind, to the point that we were having days almost completely powered by wind, with over 30% of the generation on average. Alinta had pulled out, the gas power plants weren’t being used much due to the gas contracts being on the International energy market and in September of 2016 there was a massive blackout in Adelaide which rattled everyone. A large Tesla battery was announced as part of the work to help counter such issues. But that’s mainly for stabilising the power with millisecond response times in case of an outage, it isn’t enough to help counter the variable wind and solar to smooth out issues over a larger time frame. On the 14th of August the SA Government had announced it’s tender for 75% of the government’s long-term power supply. A power purchase agreement with Solar Reserve to supply the next 20 years of power, powered by Solar Thermal with molten salt storage. Success! Nearly 10x the storage of the Tesla battery. SA is on track to become mostly powered by renewables. There’s a lot LOT more to the story, many actions, events, discussions, politics and technical points which I’ve glossed over. http://www.adelaidenow.com.au/news/opinion/daniel-spencer-port-augusta-solar-power-plant-sends-a-message-that-renewable-energy-is-the-future/news-story/21166f3efa2a7373749861ca924b30c9 – A great article by Daniel Spencer, one of the most important, continous activists on this campaign. https://www.linkedin.com/pulse/sas-big-new-solar-plant-everything-you-need-know-ketan-joshi – Ketan Joshi shows some great stats and info.